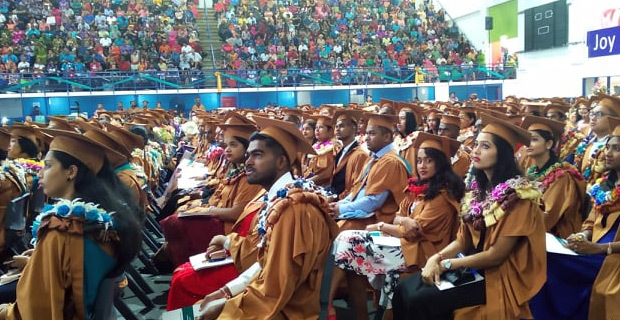 More than 900 students graduated from the University of the South Pacific at the FMF Gymnasium yesterday. 726 students were from the Faculty of Business and Economics while 580 students were from Pacific Technical and Further Studies. A total of 2026 students graduated in the three graduation ceremonies which have shown an increase of 10%of students joining the university and graduating over these years. Amongst these students was young Keti Lavenia, on crutches receiving her degree in Bachelors of Commerce. It was not an easy journey for Lavenia but she did not give up hope. 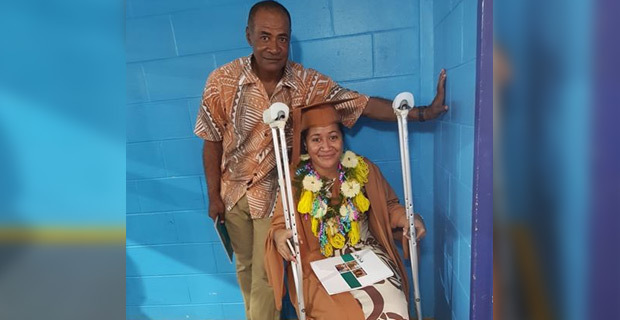 Lavenia who is from Lautoka, joined the university in 2014, however had to drop out due to family issues, but this did not stop her from trying hard. Making up her mind and returning to university in 2016 was one of the best decisions she made in her life and due to the government’s support, the financial burden was lifted off her family. Lavenia encourages the youth to stand up for what they believe in as disability is not inability. She dedicated her hard work to her parents who supported her throughout this journey.